Dr. Robert Truman Hungerford is an attorney and alumnus of The University of Arizona. He is currently the only individual with proven connections to the May Day Mystery. Born in 1947, Dr. Hungerford attended Camelback High School in Phoenix, graduating in 1965. 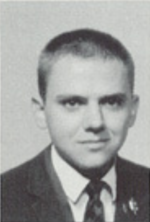 He attended the University of Arizona in Tucson from 1965 until 1969. There, he studied Liberal Arts and was involved in the Young Republicans Club, Honors Programs, Philosophy, and Oriental Studies. He received his doctorate in Theology from Drew University in New Jersey, and his law degree from the University of Arizona School of Law. He was admitted to the practice of law in 1993. Dr. Hungerford is a member of MENSA. According to the State Bar of Arizona, he speaks Dutch, German, Greek, Hebrew, Latin, Russian, and Spanish. "It is entirely possible that all of this is the work of one person, disturbed or otherwise, it could be for amusement, could be mental illness, could be anything," he says. "But on the other hand … that wouldn't be a bad cover, if one needed a cover." Regardless of its origins, the May Day Mystery is intimately tied to the production of the Wildcat. Hungerford says the group may have other methods for contacting one another, however, he admits the ads have a way of attracting new members. "Like a tuning fork, there is resonance with the right people," he says. He also contends the group, which he refers to as The Brotherhood, has a growing membership. "Is there a growing underground army of people waiting to take up arms?" he says. "It would be a wonderful thing if there was, but I wouldn't confirm or deny it even if I could." In a 2017 interview with Phoenix Magazine, Dr. Hungerford admitted that he was linked to the May Day Mystery. “The May Day Mystery arose out of a group formed in August 1969,” he says. “There were earlier messages than the first one printed in 1981, but they were in a different medium, which I’m not at liberty to disclose.” Hungerford says there’s no need to find the previous messages to solve the mystery. This page was last modified on 2 August 2017, at 19:54.